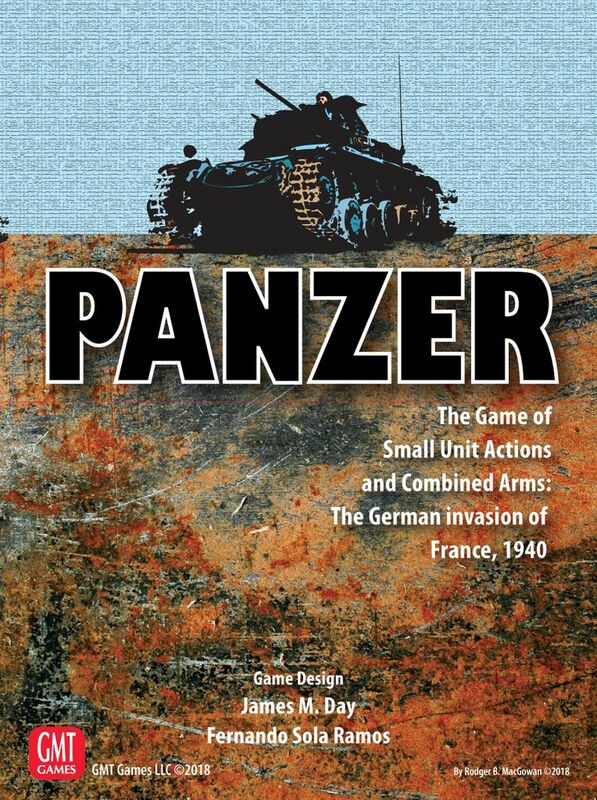 As you remember, GMT Games Panzer is my favorite tactical WWII game. If you want to know why – please check the base game review. So I was very excited when GMT Games announced and released the expansion dedicated to one of my much-loved WWII campaigns – France 1940. I was eager to know how James Day and Fernando Sola Ramos (author of terrific Panzer Pusher resource) implemented all this 1940 stuff like auftragstaktik, early war tank models, command and control issues, etc., so I dived right into the box. Photo of contents made by Fernando Sola Ramos. 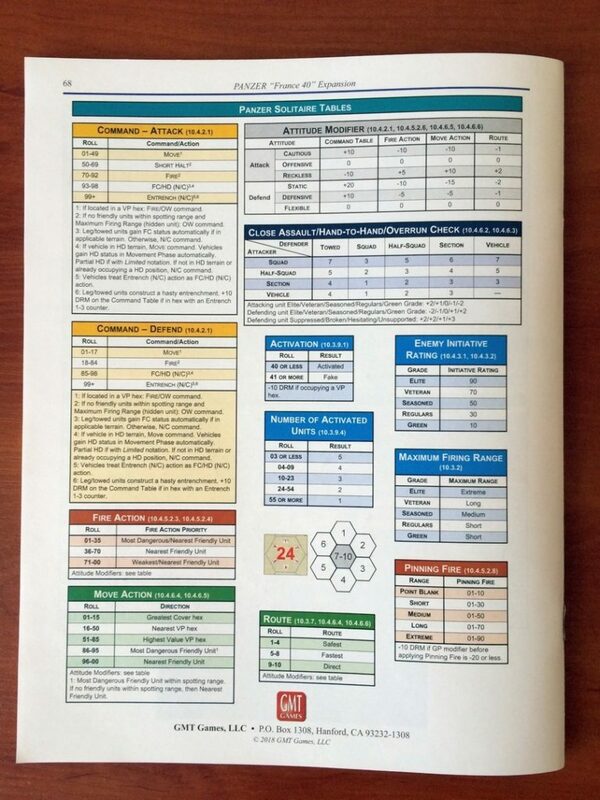 Box contents welcomes you with 4 counter sheets, 4 double sided maps, 21 data cards, roll of plastic bags and two full color booklets. What do we usually expect from the expansion in general? More panzers, more scenarios, more maps and more rules. You will find plenty of each in the Panzer Expansion #4 box. Let us submerge deeper into all that stuff. One look at new data cards from expansion can tell why Germans were so scary of the French tanks like Char B1-bis. Check all these 20mm, 25mm, 37mm guns, they are so gorgeous! Of course, all the unit types point costs are balanced to be easily integrated with the rest of the vehicle park from other boxes (even MBT): one of the best French tank of the campaign (Char B1) valued slightly more than half of T-34/85. 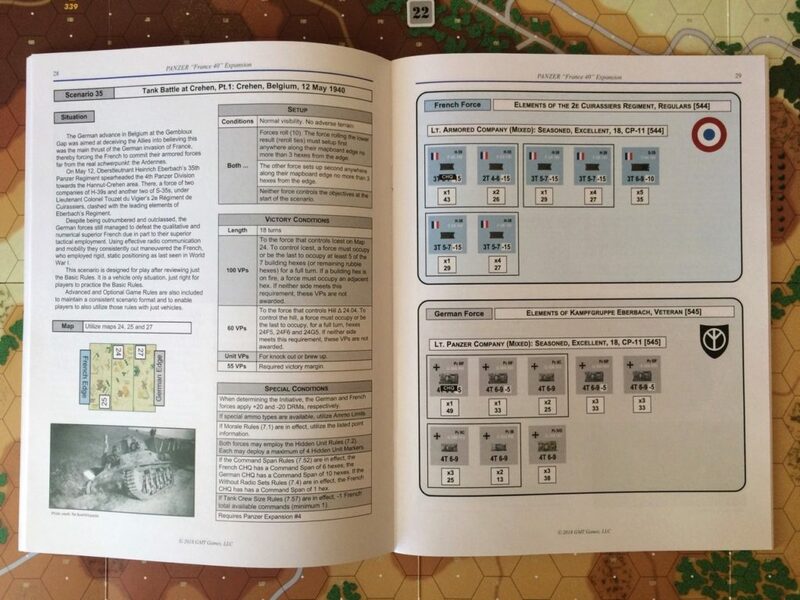 You have your traditional for Panzer Expansions Table of Organization and Equipment booklet that gives an insight, what mixes of AFVs, guns and infantry were used by the real formations during the campaign. 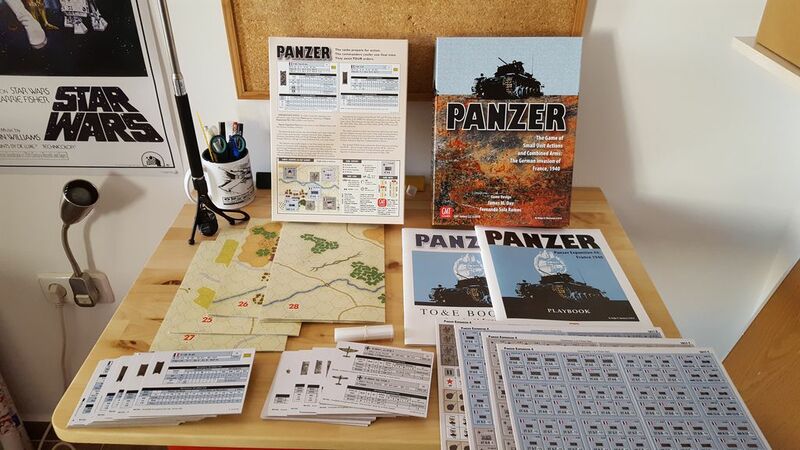 If you play Panzer by gathering your forces ad hoc spending points from some pool determined before the game on random generated map, this booklet will give you a feel, how to play it in historical way. The expansion provides an interesting mix of maps including famous historical areas like Stonne village to use in accompanying scenarios or custom generic battles. In my opinion, the maps are well balanced between open and close terrain areas to provide diverse gaming experience. There are also new supportive counters to mark small arms spotted fire from infantry and victory point locations for all present nationalities (Soviet, German, French and Allies). Owners of MBT expansions already have these, but now they finally appeared in Panzer. Panzer players now may implement the optional rules of selective damage in MBT style with new damage counters: if AFV was damaged via turret hit, it receives only shooting penalty and if it was damaged through the hull hit, it receives only movement penalty. Panzer Expansion #4 continues the tradition started in Exp. #3 with adding and refining optional rules. If you don’t have the Expansion #3 you will find all the optional rules introduced there, like Tank Fright, Removing Spot Counters by roll, Staggered Initiative, Air Bursts, Defensive Fire and so on. There are also new optional rules like Voluntary Bail Out (allows you to save precious command resources taking out your own immobilized or disabled units that fell behind without points loss), Tank Crew Size and Quickdraw (simultaneous Second Player direct fire in response to First Player direct fire with several conditions). But maybe the most interesting additions are Leaders that were introduced in the MBT expansions and now appeared in Panzer (the box will provide leaders for all previously released nationalities) and solitaire rules. Let’s examine those additions in more details. Leader is a new counter that may be attached to vehicle, leg or towed unit at the start of scenario. There’s no strict rule, how many leaders you players may use – they should decide mutually before the start of the game. 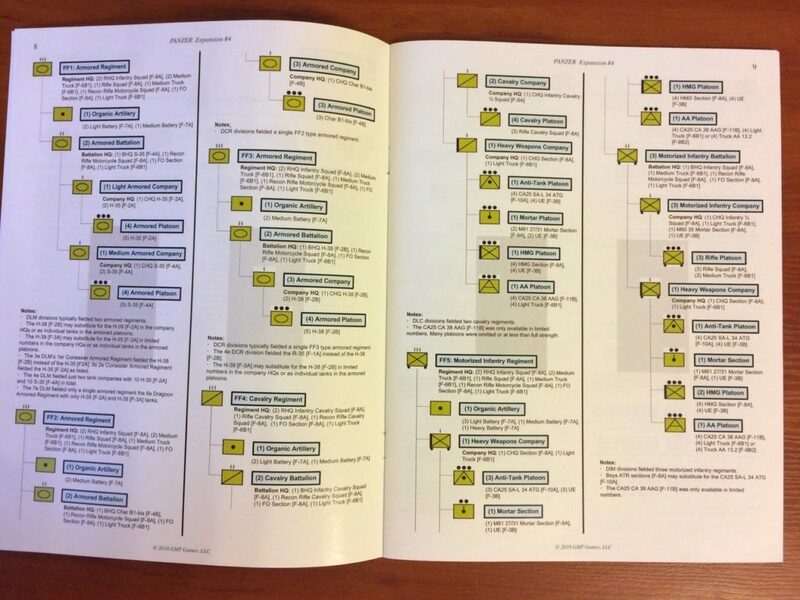 Though, there are some guidelines in the rules that show the command structure of different nations that could help to decide (for example, if your battle is between two companies, you may decide to assign captain to company HQ and junior officer of senior NCO to every platoon). Leader provides several modifiers within command range, making player to watch for the company and platoon groupings more carefully, maintain formations and command/control structure, so maximum of your units receive the bonuses. All the modifiers are specified on the leader counter itself. For example, A1 G5 S5 M5 P1 R1 means that leader provides +1 AP Hit modifier, +5 GP dice roll modifier, -5 Suppression Recovery modifier, +5 Morale dice roll modifier, +1 Spotting modifier and +1 Indirect Fire Response mod to the commanded unit and units within command range. So I would say the leaders do not break the game, they give just small bonuses, though in Panzer game you will like to get every possible positive modifier. When unit with leader is destroyed, the leader is permanently removed from the game, so HQ units obviously become most priority targets. To avoid such problem I would recommend to display all chosen leaders near the board, but record their assignment secretly as you do with HQ unit IDs. One of the most anticipated additions to the series were the solitaire rules. Most of us enjoy playing solitaire to learn the rules, try different risky approaches and tactics, and eventually… it’s always your turn! 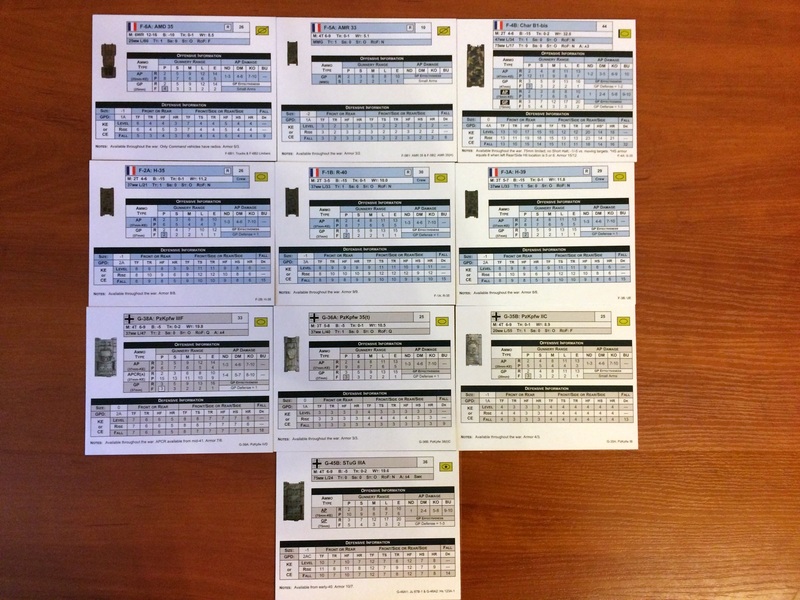 Fernando Sola Ramos developed and implemented 13 pages of solitaire rules. The rules are written perfectly with many examples demonstrating all new and unfamiliar concepts. So, how does it work in general? You setup potential enemy units on the map as hidden units in the predetermined hexes and your force in familiar style on the map edges or some designated area. Enemy behavior based on the combat attitude determined by scenario rules. 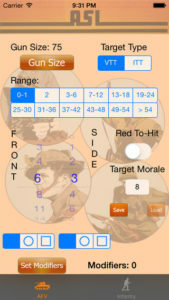 You have a set of solitaire tables that determines type of order received by enemy unit and style of resolving the order based on the dice roll. Attitude modifies the dice roll in such way that cautious enemy will try to seek cover and entrench, firing your most dangerous units, while reckless enemy will try to close with your troops, aiming for the weakest elements to get the most kills. Rules provide the detailed guideline how to make the decisions for the AI, what units it consider the weakest or the most dangerous, how to choose the safest or fastest routes for AI movement and destinations where it want to get. Enemy hidden units hold their shots until your unit appear at reasonable distance to be hit. When it’s time to activate the enemy hidden unit (for example, it turned out to be within spotting range) you roll to determine if it is real or fake (dummy) unit. If it real, you roll on quantity table, as one hidden marker may represent from 0 to 5 units. Then for each real unit rolled you determine the kind of unit using scenario formation table and place them around hidden marker hex using special diagram. The system works fantastic, though it demands some fiddly work from you, so be prepared to spend several sessions without haste to finish one scenario. One may ask if it is possible to play any scenario using solitaire rules. I think it is possible, but will require some homework to do. 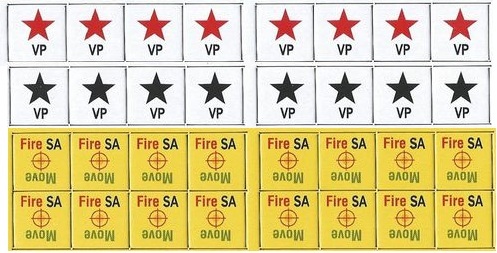 In the dedicated solo scenarios, the designer thought over the quantity and positions of enemy hidden unit markers in relation with victory conditions, their possible packing, overall force attitude and special modifiers. Therefore, what one may need to do is to convolve one of the force from regular scenario into the set of hidden unit markers and decide their positions. 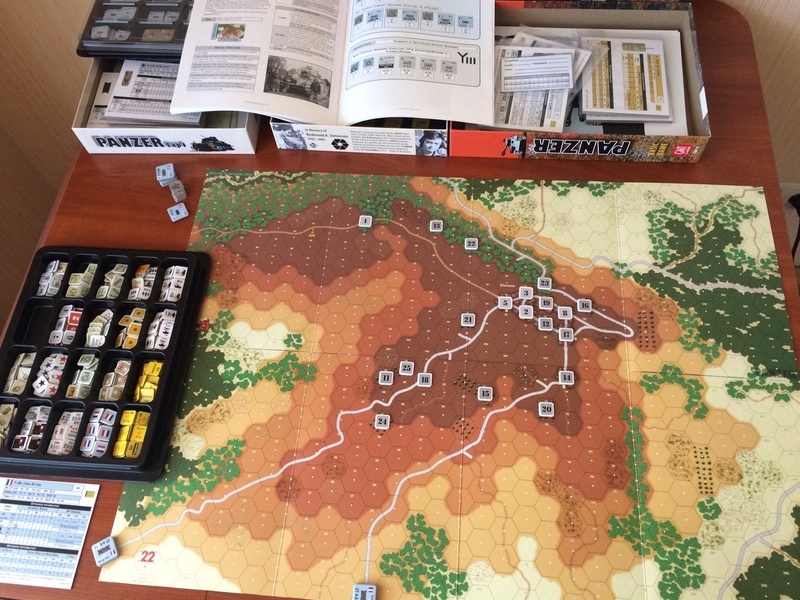 You will definitely need to play both solo scenario from Panzer Expansion #4 (may be several times) to realize how everything works and how force ratio is balanced in the light of hidden unit marker usage and their advantageous positioning against the player. We may only hope that Fernando will release the guidelines for converting the regular scenarios to the solitaire style. The scenarios take place not only in France but also in Belgium. There are twelve of them: traditional ten for two-player games and two dedicated to solitaire rules. The first scenario, as in the base game, can be played just after reviewing the basic rules representing vehicle only situation. As we already saw in the base box and previous expansions, the involved forces tends to be larger and larger with every next scenario (with exception of scenario 43). All scenarios has historical optional rules recommendations and utilizes only maps from the box, so you don’t have to own any previous expansion. I highly recommend this expansion for all Panzer fans, as it adds a new playing dimensions to your beloved tactical game.